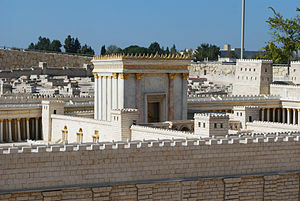 A model of the second Jewish Temple in Jerusalem. The second temple existed in the time of Jesus in the Gospels. (1Chr 29:9) Then the people rejoiced, for that they offered willingly, because with perfect heart they offered willingly to the LORD: and David the king also rejoiced with great joy. The story of 1 Chronicles 29 marks the inevitable coming end of King David’s reign, the best King the land of Israel has ever had. And upon bidding his farewell, his interest still was all about the Glory of God – the Glory of His Temple on earth and how His chosen nation should worship and render service to Him. With that on mind, he spoke to the people of Israel about his plans for the Temple, and what seemed best for the preparations in building it. He was also telling them that he has already prepared some of the construction materials needed. He was asking the people if they would be willing to render their service to this great task of building God’s Temple. Many responded – in fact, all of them gave their part and contribution. There was joy and gratitude all over – they loved to give to God, and not to the king. Here we can see simple truths about giving for the service of the Lord. 1. Giving, I mean heartfelt and delightful giving should be started by the leaders. It was started by the David, followed by the rulers and princes of the tribes of Israel. A good leader is a good example, right? They are the ones whose selfless service and sacrifice should be seen first which would be used by God to inspire the people to do the same. 2. Giving should be transparent and accountable to both God and the people. As these leaders gave, it was recorded – to be known to all with exact measurements. (1Chr 29:7) And gave for the service of the house of God of gold five thousand talents and ten thousand drams, and of silver ten thousand talents, and of brass eighteen thousand talents, and one hundred thousand talents of iron. The church should also do the same. The congregation would like it best for their giving to be accounted well with precision and accuracy to be known. It also gives them the assurance that their giving really goes to where they should be used. 3. Giving started well would also inspire others to give willingly. Being a good example commands powerfully more than words do. (1Chr 29:8) And they with whom precious stones were found gave them to the treasure of the house of the LORD, by the hand of Jehiel the Gershonite. I could still remember how our former pastor showed us a good model for giving. He gave abundantly and inspire us to give also cheerfully with what we have. He gave not only financially and materially, but his efforts and perseverance as a carpenter (though not his profession) also proved to be a powerful magnet to motivate us to work with to renovate our Church building. 4. Giving gives joy to both the leader and the congregation. True giving, if done rightly, should never be a source of burden but of great joy. The true giving of the leaders brings inspiration and joy to the church – and vice-versa. How good it is to see selfless and sacrificing people of God! 5. Giving inspires us to worship God and remember His goodness in our lives. Every true giving should begin and end in worship and gratitude to God. (1Chr 29:10-20) Wherefore David blessed the LORD before all the congregation: and David said, Blessed be thou, LORD God of Israel our father, for ever and ever. Thine, O LORD, is the greatness, and the power, and the glory, and the victory, and the majesty: for all that is in the heaven and in the earth is thine; thine is the kingdom, O LORD, and thou art exalted as head above all. Both riches and honour come of thee… Now therefore, our God, we thank thee, and praise thy glorious name. …all things come of thee, and of thine own have we given thee. I know also, my God, that thou triest the heart, and hast pleasure in uprightness. As for me, in the uprightness of mine heart I have willingly offered all these things: and now have I seen with joy thy people, which are present here, to offer willingly unto thee. And David said to all the congregation, Now bless the LORD your God. And all the congregation blessed the LORD God of their fathers, and bowed down their heads, and worshipped the LORD, and the king. The church has many problems in regards to giving – to be more specific, heartfelt giving. But if these simple truths from the Bible be instilled onto our minds and hearts – the Church could experience revival in this area. 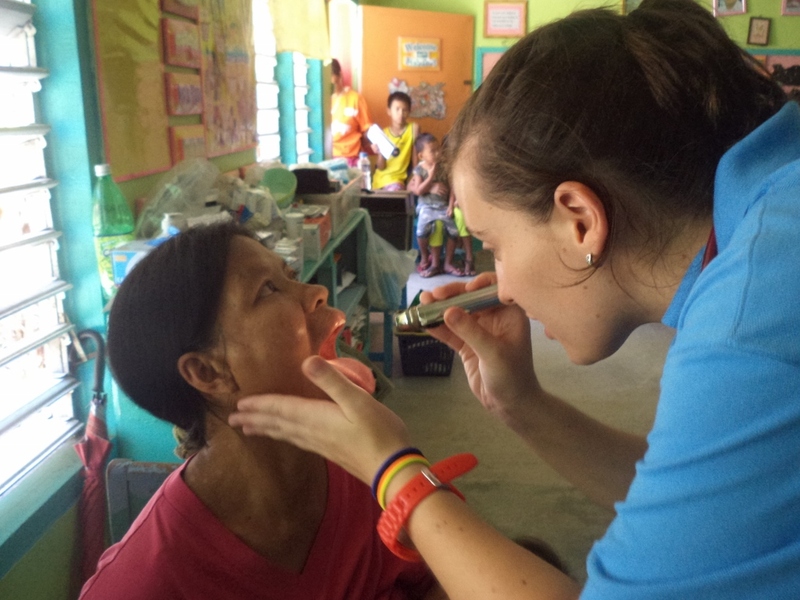 Dr. Mariana checking the oral health of a woman. God taught me wonderful new things during the recent four-day medical mission done at the place where our current local church is. The experience is overwhelming, fruitful, challenging, and uplifting. It was headed by the Mercy Link and the Youth With a Mission, targeting the island of Mindoro for the dental, medical, and mission outreach. The doctors, nurses, and medical technicians were coming from different countries – Brazil, New Zealand, Korea, and the United States. Their arrival to our place at Lumangbayan san Teodoro was truly God’s answer to our long-time prayers. We had been seeking God on how we could provide medical assistance to the community and at the same time offer them the friendship of Jesus. Their outreach started on Monday morning, May 6 and ended on Thursday, May 9 at midday. Almost four days. Days that granted me some helpful thoughts to live by. 1.) It is not about what we could receive, but what we could possibly give. The direction of love is always not towards the self, but always towards the service of others. I went there with very little pocket money and resources, challenging the provision of God. As I was trying my best to keep up with my physical needs, the unexpected happen – someone from the Church took away my reserved bowl of fish! I was expecting that they would be the ones who would give me assistance, but the opposite happened. Anyway, it is about what I could give, not what I could receive. 2.) Trusting in God does mean not underestimating Him. Continuing the first learning above, God showed me that my ‘trust’ wasn’t great enough. Truly trusting Him would mean being open to whatever ways God could open up and spill over His resources – in ways that we have not possibly thought possible. For my example I was worrying about my food – but God gave me extra that for two times my food was spoiled! 3.) Be always ready to Hear His Word and heed Him. On the second day of the Medical Mission, I was commissioned by God to take every opportunity to share His Word. That was very clear to me on His Word. Yet for so many times I let my hesitance and weaknesses took over me – how I regret those times that I could have shared the Gospel and invite them to the Church! Those missed opportunities – could never be brought back. 4.) Strive to build relationships. Offering medical assistance means a lot to the needy people. But making them see and feel that their presence and friendship is special to us is a different thing – it will make them stay with us even after our medical resources are exhausted. The diagnoses and medicines provide physical healing, but when wrapped in love they will also prove to give spiritual and emotional healing. 5.) True humility always seeks out to serve – not minding the self. This is so true for the servanthood example of Jesus found on Phil. 2:5-8. Jesus took aside personal glory and instead embraced the life of a human servant all for the sake or true service. True service always has the heart of humility at its center. 6.) Give your best shot every moment. Every deed, especially those done for God and His Kingdom should truly demand the best of us. This is a helpful mindset. Not everything could be repeated, once done, that’s it. It’s either we exerted a mediocre effort of our very best. The same specific goals, in the same place for the same group of people – a specific ministry – once accomplished, could very rarely be expected to happen again. God, You are the Supreme Lord of the universe. The Only One who is Sovereign. You have entrusted us so much, may You find us faithful and diligent. In Jesus’ name, Amen.